Sometime soon after I got home from Idaho, one of my teeth started hurting when I chewed or drank cold beverages, so I stopped chewing on that side and hoped it would get better on its own. It did not, so I called my dentist last Wednesday to make an appointment. After getting hung up on by his answering machine three or four times, I manage to leave my name and number, only to have the office call me back at not the number I’d left but another one in my file, so I played phone tag for an afternoon before I connected with them. To their credit, I was able to make an appointment for the next day once I did get a live person on the line. I went in expecting to hear that the filling in that tooth needed replacing, but instead I was told, after a couple x-rays and some other tests, that I needed a root canal. The dentist wrote me a referral to an endodontist; he called the other office himself to make me an appointment that very afternoon. That gave me very little time to consult Dr. Google about what to expect, so I didn’t know a whole lot when I hit the second dentist’s chair of the day. More x-rays, more tests (tapping, cold, air, I forget what all), two shots of Novocain, a lot of noise and tugging and drilling and strange smells and tastes, even more x-rays, and two hours later I was on my way with a temporary filling, two prescriptions for pain medication, and instructions to return to my dentist in a week to have him start on the work needed to make the repair permanent. At this point, I’m not entirely convinced I shouldn’t have just ignored it a while longer, since most of the weekend, I was in more pain than I’d been before I went in. At least it’s not sensitive to cold and air anymore, but it’s a lot worse than it was when I accidentally bite down on that side or bump it with my toothbrush. It’s not as bad today, I don’t think, but I’ve been babying it, having a breakfast that didn’t require much chewing. I’ve got a call in to my dentist to schedule the next appointment, so with any luck by the end of the week I’ll have gotten the next steps in this process done, though I suspect there may be at least one more appointment needed after that because the word “crown” was mentioned. 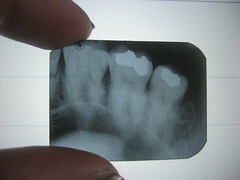 Thank goodness for dental insurance; otherwise I’d be in pain both literally in my mouth and figuratively in my wallet. Well that doesn’t sound right – isn’t the whole point of a root canal supposed to be removal of the nerve so that it doesn’t hurt at all any more? I hope it’s improving now.